Since I first arrived at Reed in 1954, Reed has been my home away from home. I met my first husband and best friend of many years, Guy Sircello, during freshman orientation. During my senior year, Reed actually hired me as acting documents librarian, and I handled that in addition to student teaching and my thesis. Guy and I coedited the yearbook one year, and Guy, a Baker Scholar, was very involved with student government. We held our wedding reception in Anna Mann, where I had lived in the same room for four years. We both returned to Reed in 1960, he as an instructor, and I originally as a “faculty wife,” but then as director of the Reed Education Project, which I founded, and later as an instructor in community organization during the summer when Reed hosted a Peace Corps training group. Our children were Reed children, taking swimming lessons on campus and picnicking in the canyon with other Reed families. When Guy decided to leave Reed because he wanted to try a larger university, I was devastated. I would have stayed happily in Portland and at Reed for the rest of my life, but back then, wives followed their husband’s careers. I have kept up my connection to Reed as much as possible. I donate what I can. My sister and I have attended many Reunions. We always stay in the dorms, and subject our husbands to the hard single beds and spartan luxuries of the old dorm block. You can imagine how happy I was to learn that one of my grandsons was determined to go to Reed. He had visited and loved both what he learned about Reed while there and from me. His interests range from quantum physics, to philosophy, to music, writing, and theatre lighting. Although I know that grandparents are biased, I would not recommend all of my nine grandchildren for Reed, but certainly Andrew is one who I think would make the ideal Reed student. Reed would profit by his attendance, and of course I think that he would, as I do, treasure and benefit from his Reed education for the rest of his life. His parents intended to cash in savings, and thought that the modest income from an Hawaii college professor and a self-employed dance teacher would qualify him for a partial scholarship. However, it turns out that middle class students no longer need bother to apply to Reed. Reed goes strictly by the needs assessment that you get from some “impartial” national website. Reed goes by “need,” and nothing else. Therefore, the tendency is that you have to be either wealthy or disadvantaged. Unfortunately, my son-in-law is near retirement, and the situation is such that they will need the retirement money while my grandsons are still in college. Living in Hawaii presents unique economic problems. None of those individual circumstances can be taken into account. Shouldn’t Reed make at least some scholarship money available for ability or other qualifications, and not just financial need? Shouldn’t the diversity that Reed says it treasures include the diversity of students from the true middle class? Let’s hope that the next Steve Jobs is not driven from Reed by misguided policies on financial aid. Editor's Note: Thank you for raising this important issue. Federal privacy laws prevent us from commenting on specific applications in public, but in general, we can say that the goal of financial aid at Reed is to assist qualified students who could not otherwise afford to come here. Thus our financial aid is based on need, not merit. Although this approach has its drawbacks, we believe it best allows Reed to reap the benefits of an economically and socially diverse student population. Is this unfair to middle-class applicants? Median family household income in the U.S. in 2010 was $61,544, according to the Bureau of the Census. 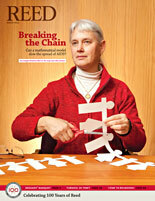 The median parental income of students on aid at Reed is $62,404. In other words, if you define the middle class by income, Reed’s aid is largely going to the middle class. Like most colleges, Reed uses a nationally standardized need-analysis formula to arrive at a family’s expected contribution. However, Reed does take into account special circumstances such as impending retirement and the high cost of living in certain areas; and for what it’s worth, retirement assets are not included in the need analysis. Having said that, we share your concern about the middle-class squeeze. Reed is constantly seeking ways to increase its budget for financial aid, which currently stands at $22.5 million. Roughly one-half of all Reed students receive financial aid; the average package—including grants, loans, and work opportunities—is $35,990 per year. I remember the incident. In 1968–69 I was a first-year student residing on the second floor of Doyle, with windows facing the commons area. One night (or very early morning) I was awakened by an orange glow and noise from the window. Something was burning brightly. I remember going outside to find firemen fighting a fire. I stood next to a pumper talking to the fireman in attendance. He took the time to answer my questions, and I distinctly remember being told that with higher pressure (pounds per square inch), the rate of flow (gallons per minute) decreased. I did not know Bernoulli’s principle at the time, so his statement caught me by surprise. I’m sure I doubted it until I next encountered it when teaching physics many years later. The memory is vivid—but I’ve always thought I remembered the infirmary burning rather than the student union. Do your records definitely state it was the SU? Editor's Note: We goofed. The building that burned on May 21, 1969, was the OLD student union, later known as the theatre. Its name and role changed in 1965, with the opening of the new commons, at which point the old commons became the new SU and the old SU became the theatre. (After the fire, a new theatre was built in the canyon.) It certainly seems possible that the glow from this conflagration could have been seen from Doyle; in any case, we find no record of a major fire in the infirmary. Just a quick clarification (er . . . maybe question). Was I dreaming when I was at Quincy dorm in fall 1972 and Steve was downstairs on the second floor with Michael, his roommate? Didn’t we share some interesting conversations concerning God, the Meaning of Life, and why are we here? And, didn’t I take the opportunity to ask the still unformed Reed College Christian fellowship to pray for him because he seemed at the time to be lost and “searching”? These first few months that I knew Steve seemed to be so absent from the record. Maybe I have it wrong, but I think this first period of time at Reed was the quiet time, an “unknown” Steve. Could somebody please confirm to me that I have my own memory intact? Thanks. 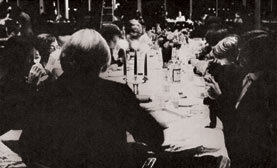 Students reverse the social polarity of scrounging with candelabra and white linen at the Beggars’ Banquet of 1969. I just read with interest “The Origin of the Scrounge.” I would like to add a few comments. I was a scrounger during the 1969–70 school year. I reluctantly became a scrounger because I’d spent my year’s school money on a motorcycle. I never heard it referred to as “the scrounge.” It was simply “scrounging” and I was a “scrounger.” Once my initial hesitation had passed, I discovered that it was the best way to enjoy a meal in Reed’s fine cafeteria. The trick was to develop a fan base. These were mostly women, because they tended to eat less. Each one would bring me one component of the meal, which they took but did not wish to eat—a vegetable, potatoes, main course, and dessert. I never had to touch half-eaten food. In fact, I ate better than those with meal tickets because I got to try everything. At the time, there were between two and six scroungers. Toward the end of the school year, the number grew to about a dozen. There were two other things I remember about scrounging—we enjoyed the meals because we didn’t take them too seriously, and we all shared. No one went hungry. Also, we were very respectful of the kitchen crew and often helped them clean up. They returned this courtesy. 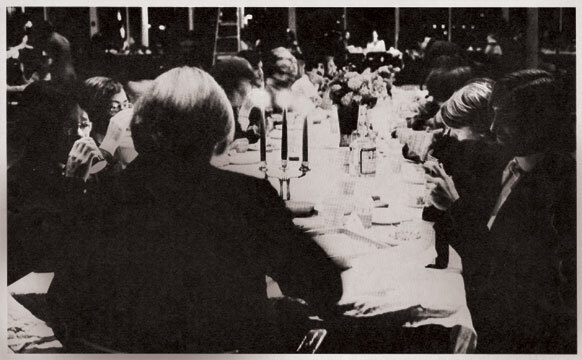 On November 7, 1969, the kitchen crew set a table with white linen and candelabras in the middle of the dining hall. We found old tuxedos from the Goodwill shop and were served by the kitchen crew, who scrounged the food for us! It was called the Beggars’ Banquet, and, if you find the picture in your archives, I’m the second guy on the right. I was appalled, discouraged, and saddened to see no faces of clearly African descent among the 24 new faculty members pictured in the recent Reed magazine. It didn’t encourage me that only one of seven new tenure-track appointees appears to be from a minority community. This pattern leaves me wondering whether the presidential search will be broad, innovative, and bold enough to position Reed College well for the 21st-century diversity of our nation and global interconnectedness. The college proclaims its emphasis on increasing diversity, but if students do not “see themselves” generously among faculty, the effort cannot be considered a robust one. The effect may be subtle, but it can discourage minority students from applying and from deciding to actually attend if accepted, and can contribute to their dropping out. When I attended Reed in 1960–64, there were few women faculty. So, I know first hand the negative effect this lack can produce. It would have helped me to have the informal mentoring that is part of sharing basic similarities. Reed has hired in a variety of faculty positions in recent years, but diversity does not appear to be improving. It looks like you are still giving unacknowledged preference to those who are most similar to existing faculty members. Breaking the mold of hiring those who look and present as you do is difficult. It is harder to predict how one will succeed and how they will fit in. Why invite discomfort? Apparently Reed has not faced this challenge in a proactive, organized way; students and society are negatively impacted as a result. Had it not been for affirmative action and—dare I say? quotas!—I might have spent my working life in jobs toward which my gender aimed me and from which my aptitudes and interests rebelled. I am grateful for the opportunity. In the 1960s and ’70s, it was difficult for me to be hired into “men’s jobs” because employers could not predict my performance and I didn’t fit their preconceptions of the occupants of the position. I was a risk. Who wants to hire a risk? Without quotas, I doubt I would have been launched into the variable, challenging, and satisfying succession of positions that made my working life successful. Perhaps Reed College needs an internal, informal quota system for diversity. Maybe when two candidates are similarly qualified and the one closest to your mold (including alumni) appears slated for selection, that predilection requires serious reconsideration at the highest levels. I am not qualified to propose a solution, but I clearly see a problem and am pointing it out in hope you will take action to solve it. Editor's Note: (from Crystal Ann Williams, Dean for Institutional Diversity & Associate Professor of Creative Writing, and from Patrick McDougal, Acting Dean of the Faculty & Howard Vollum Professor of Chemistry) Thank you for your thoughtful letter. We are always grateful when presented with the ideas of alumni engaged in imagining how Reed might become a more inclusive, intentional, and culturally and intellectually pluralistic community. While we acknowledge imperfection in this regard, we are in the process of developing means by which to identify, target, and hire more faculty from underrepresented ethnic groups. Most contemporary efforts related to diversifying the faculty are a result of a faculty resolution dated April 5, 2004, which reads in part: “As the faculty ponders ways to improve the college, the faculty resolves that the ethnic diversification of the faculty and student bodies at Reed College should be among the highest priorities during the upcoming [current] capital campaign.” We have certainly not met our aspiration, which is to become a significantly more ethnically diverse institution on all levels—in the student, faculty, and staff bodies—but since 2001 we have added eight tenure track members from underrepresented ethnic groups to our faculty. Your letter sparked the realization that we have not formally engaged alumni in the conversation about diversity and inclusivity. Look for an article in the next issue of Reed about faculty diversity, its relevance to the academic mission of Reed, and how we are positioned in the world of the highly selective liberal arts college. I was saddened to read in the December issue of the death of Professor Helen Stafford [biology 1954–87]. I was among the earliest of the Reed students over whose career Dr. Stafford had a major influence. In 1956–57, I took the introductory biology course as a junior physics major. She asked me one day, knowing I was a physics major, if I knew anything about solar batteries, since one of the well-known researchers in photosynthesis—and a future Nobel Prize winner—had just proposed that light harvesting in photosynthesis worked like a solar battery. I’m not sure I was ever able to explain it to her, but I ended up taking both her plant evolution and plant physiology courses and did my senior thesis on photoconductivity of plant chloroplasts. I was pleased that she signed the thesis approval page along with Professor William Parker [1948–79], my physics thesis adviser. I suffered comments from both ends of the basement of Eliot Hall, where the biology and physics labs were located at the time, as I rushed the chloroplast preparation from Dr. Stafford’s lab to my apparatus in the senior physics lab. Helen also introduced me to Stacy French, then director of the Carnegie Institution of Washington’s plant biology lab, where I spent two summers as an assistant and continued some of my Reed thesis research. I went on to a career in academia, pursuing research on the light-harvesting process of photosynthesis and teaching biology, plant physiology, and plant biophysics, all the consequence of that initial short conversation. One of the personal things I remember to this day is the twinkle in her eye and wry smile as she posed a thought-provoking question for me to ponder. I received Reed magazine yesterday and was struck by the article about the Reed 11 (September 2011), specifically by the interview with Jessica Gerhardt ’11, as I also graduated in psychology and also planned to spend the following year pursuing music. I did in fact do that and spent much of the following years playing in bands (including Rachael Sighs and Tesseract) in Portland area bars, making (and trying to sell) independent records, and selling guitars in a music store on Southeast 39th Avenue. Reading Jessica’s interview made me excited all over again, imagining the prospect of just coming out of Reed and going for it as a performing musician. I wish Jessica all success and I pass on the following advice: “Go at it boldly, and you’ll find unexpected forces closing ’round you and coming to your aid” (William Benjamin Basil King, Anglican minister and author, 1859–1928). Editor's Note: A well-placed source confirms the existence of two rubber stamps in Ed Segel’s desk drawer: one proclaims TIHSLLUB and the other YKCAT. Accounts differ on when the stamps were last wielded, but we understand that during Ed’s reign the mere threat of their deployment was sufficient to maintain order. 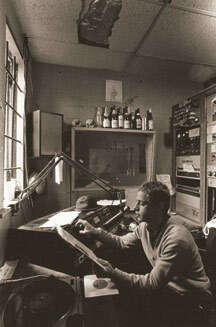 After exhaustive research, we have confirmed the identity of this enigmatic KRRC DJ: he is David Levinson ’83, whose show featured twentieth-century and avant-garde classical music.